RHSQ Dig Tree Historic Reserve, cairns and sign. Camp LXXVI (fake) marked tree, Birdsville. Boulia cairn, bridge, plaque and sign. IPL Phosphate Hill sign, 2011. Jim McDonald's O'Hara's Gap plaque. Alfred Towner's Kings Gap plaque. Camp CXIX cairn and sign, Bynoe River. Becker, Stone & Purcell's grave, Koorliatto Waterhole, Bulloo River. David Hillan's Camp CXX Marker. Legislation to protect sites in Queensland. Many of the sites are listed on the federal Register of the National Estate or State Heritage Register and are protected under State and Federal legislation, including the Australian Heritage Council Act 2003 and the Protection of Moveable Cultural Heritage Act 1986. 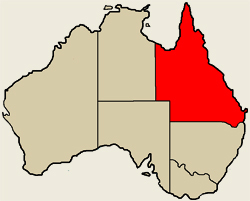 Digging, excavation, searching for artifacts and use of metal detectors at historical sites associated with exploration history is prohibited under State legislation including the the Heritage Act 1992 (Queensland). Additional legislation associated with the Aboriginal and Torres Straight Islander Heritage Protection Act 1994 (Federal), and Aboriginal Cultural Heritage Act 1993 (Queensland) affords additional protection at a number of significant historical sites.